SUBHEAD: The current model of economic growth is not only unsustainable, but the source of our problems. 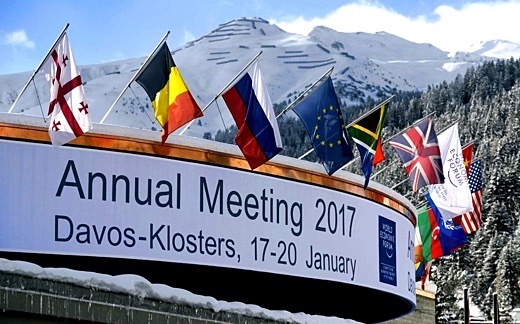 Image above: Entrance at 2017 Davos Forum . From (http://www.telegraph.co.uk/business/2017/01/19/europes-ideological-civil-war-laid-bare-davos/). The World Economic Forum (WEF), a Swiss non-profit foundation for public-private cooperation “committed to improving the state of the world by engaging business, political, academic, and other leaders of society to shape global, regional, and industry agendas”, met in Davos from 17-20 January of 1027, as it does every year, in an ambience of high-level meetings interspersed by opulent partying. It is essentially an annual jamboree to bring together many hundreds of extremely rich and powerful top business magnates, international political leaders, selected intellectuals, and journalists from around 100 countries, “to discuss the most pressing issues facing the world”. WEF focuses on business profit and national economic benefit. Post the unrealistic Millenium Development Goals (MDGs) of 2000, the 2016 WEF was about 17 sustainable development goals (SDGs) with a 15-years time target ending 2030. SDGs were to “transform our world” by ending poverty, protecting the planet, and ensuring prosperity for all. The means of achieving these goals was through economic growth, social development and environmental protection. In a world of over seven billion people, a majority of whom live in abject poverty, it is difficult to imagine more reality-disconnected persons meeting in a more inappropriate forum to discuss how to end poverty, protect the planet and ensure prosperity for all. Economic growth is understood as increasing economic activity of business, commercial, industrial and services sectors measured by growth of the gross national product (GNP). All countries, independent of political ideology, single-mindedly pursue economic development based on GDP growth, targets for which are set in percentage points for each year. GDP growth is in turn based upon increasing consumption of all kinds and trade of all kinds, including armaments. It pre-supposes endless material growth based upon extraction-manufacture-transport-consumption within the ecological resource base, the finiteness of which most economists are unable to take into account. Every stage of the extraction-manufacture-transport-consumption mantra is entirely based upon the continuing extraction-refinement-transport-consumption of oil as a fuel. The finiteness of the resource-base is both in terms of being the source of materials and a sink for the polluting outputs of the extraction-manufacture-transport-consumption processes. “Our first concern is to redefine the purpose of development. This should not be to develop things but develop man. Human beings have basic needs: food, shelter, clothing, health, education. Any process of growth that does not lead to their fulfilment – or even worse, disrupts them – is a travesty of the idea of development”. In the last 42 years, the United Nations has not withdrawn or modified its 1974 people-based definition of the purpose of development. But all participant countries have quietly jettisoned the jointly agreed purpose of development and adopted a model in which the social, economic, political and cultural development of people is at best secondary. This has caused enormous socio-economic inequality within and between nations, and this inequality is growing. For example, in India, one of the economically more unequal countries, the richest 1% own 58% of the wealth, with social status proportional to wealth. According to one assessment, the richest 1% of all humanity will soon own over half of the world’s private wealth. The sustainability of such growth in socio-ecological terms is being increasingly questioned. The anti-Wall Street protests of 2011 in USA are fundamentally against inequality between the top 1% and the rest 99%. But somehow, the reasons behind these protests and many others worldwide, do not appear to have even been considered by the decision makers in Davos over the years. In the context of sustainable economic growth, one of the Davos goals of SDG is to eradicate poverty in all its forms by 2030. Indeed, SDG Target 17.19 seeks to: “… by 2030, build on existing initiatives to develop measurements of progress on sustainable development that complement GDP”. “Problems cannot be solved by the same level of thinking that created them. Without changing our pattern of thought, we will not be able to solve the problems we created with our current patterns of thought”. It does not call for any great learning to appreciate that economic inequality increasing within a finite and shrinking resource base, leads to increase in poverty both in numbers and degree. Thus, pursuing the present economic growth model which is the cause of the huge and growing economic inequality both within and between countries, makes the SDG of poverty eradication in 15 years unachievable. This SDG aim, going beyond semantics, betrays a mindset that humans, with their technology, can control the elemental forces of nature to “protect the planet”. The reason for articulating this aim is that the human activity of industrialization by enormous consumption of energy (fossil fuels) has caused threats to humanity itself. The understanding that humans are a part of the planet and of the eco-systems that are at the very root of life itself, is absent from the anthropocentric mindset which seeks to protect the planet. The planet per se does not need protection. The human species is urbanizing rapidly precisely because of the availability of fossil fuels. Urbanization is nothing but a concentration of human populations, connected intimately with availability of energy in more concentrated form, which fossil fuels provide. Today, more than half of all humans are urban creatures, who are parasitic on the energy base. China and India, together comprising around half of humanity, both encourage urbanization as policy, both inexplicably blind to the resource-base imperative. The energy-consumption inequality within urban agglomerations is demonstrated by the fact that the small percentage of the wealthy generate far more garbage (this includes indirectly generated industrial effluents) than the vast majority of the poor. This garbage, mostly and increasingly non-biodegradable, pollutes surface and sub-surface water bodies, air and soil, and oceans, with visible and invisible pollution. The 2011 Fukushima nuclear disaster continues to pollute the ocean with radionuclides with no real end in sight, while containing the disaster (preventing meltdown) consumes huge fossil fuel energy. All this is about degrading the environment and polluting the planet which SDGs aim to protect. At the rural levels, agriculture is heavily energy-based, with industrial inputs like fertilisers and varying degrees of mechanization. (The growing focus on organic farming is precisely because of realisation of the ill-effects of chemical farming on pollution of soil and water, and human health). Agricultural produce from farm-to-(urban)table is entirely dependent on fossil fuel for transportation, storage, treatment and processing. Consumption of fuel and all industrial products in agriculture produces pollution. Every industrial output – extracted raw material, semi-finished and finished goods and the manufacturing processes – needs huge inputs of (fossil fuel) energy, and at every stage of its manufacture and transportation from under the earth to its point of consumption, needs more energy. Products like the aircraft and automobile are of no use unless fuel is available for consumption, and in use, they generate more pollution. Every industrial product has a “useful life” and after it is consumed, it is junk, garbage, trash; and every industrial production process produces effluents during manufacture. It is axiomatic that more consumption means more pollution, and less consumption means less pollution, “consumption” and “pollution” being of all sorts. As the human species as a whole consumes more, it pollutes more. And this has resulted in global warming which is causing sea level rise and manifesting as climate change, challenging life forms on the planet to adapt or perish. There is the joke of the meteorologist getting himself transferred because the weather did not agree with him. Now Earth’s climate is changing, and humanity as a whole only has this planet and nowhere else to go, leave alone “protecting” Earth. When the WEF included “ensuring prosperity for all” in world transformation, perhaps they meant that all seven billion human inhabitants of our planet would be sufficiently well-off to enjoy adequate nutritious food, clean water and clean air, and have enough in terms of housing, clothing, health care, education and a satisfying occupation or job which brings in enough earnings to support a family. All this in 15 years, by 2030. This is not different from the development that the 1974 Cocoyoc Conference defined. But somewhat in keeping with the Human Development Index, prosperity should also include some intangibles like access to social, economic and political justice; liberty of thought, belief, expression, faith and worship; and equality of status and opportunity. It has been cogently argued elsewhere that without a modicum of justice, liberty and equality within a society, socio-economic inequality cannot be reduced, and without reducing inequality, poverty cannot be meaningfully alleviated, far less ended. The WEF aims of world transformation by ending poverty and ensuring prosperity for all, may be well-intentioned. However, what is highly questionable is whether at all they are practicable under the present GDP-based model of economic development adopted the world over, and which, within the finite resource base, is causing economic polarization and social unrest within societies. This paper brings uncomfortable facts to the foreground, and risks being branded as pessimistic for presenting the “dark side”. But rather than being pessimistic, it is about reality and the dangers of complacency that SDGs unintentionally propagate. An analogy which was presented in Al Gore’s documentary film “An Inconvenient Truth”, concerns the reaction of the frog either dumped into a vessel of hot water, or placed in a vessel of water that is heated gradually. If dumped into hot water, the frog promptly jumps out, but if in the latter circumstance, it keeps adjusting until it is too late and becomes unable to jump out. The analogy can be extended to say that humanity is like the frog in water that is being heated (global warming) by its own actions. Humanity is now sitting in the comforting warm water of SDGs. It has to act now to jump out – to a future of lower energy consumption in societies which truly embrace the values of justice, liberty and equality. GDP-driven economic growth drives consumption, which is the primary cause for global warming. In today’s world, unsustainable GDP-based economics drives politics – and the tail wags the dog. In a sustainably transformed world, ending poverty and ensuring prosperity for all would only be possible when politics is guided by principles of justice, liberty and equality, and development is re-defined, starting perhaps with its definition in the UN Cocoyoc Conference of 1974. World leaders have to understand that the current model of economic growth, especially in the context of finite resources and global warming, is not only unsustainable, but that it is the cause of the existential problem facing humanity. They need to understand the symbiosis of human and natural systems, realise the import of the gathering clouds of climate change, and take prompt action. SDGs are nowhere near realistic enough. But even now it is not too late. However, if it is left until it is too late, humanity may not be able to “jump out” and even if it somehow does, there will be nowhere to go.